Fourteen years in real estate and I still love helping my clients achieve their real estate goals. I love the variety of people I get to help. People who are selling their home they have lived in for a long time, their children buying a first home, investors buying rental property, buying or selling condos to provide more flexibly lifestyles, vacation property, and even locating realtors for people moving out of state. I am also a connector of clients and the community, serving both with equal enthusiasm. Let’s face it – buying and selling homes can be overwhelming. Whether you are looking for your dream home or want to get the best price for your current home, I strive to make sure you understand the process every step of the way. My number one goal is to make sure you are never surprised and always confident that you have the information you need to make the best decisions possible. As a lifelong resident of the Twin Cities, I can’t imagine a better place to live. 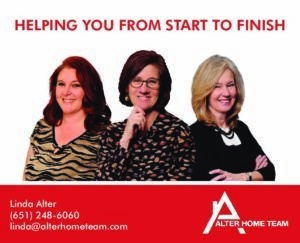 I am the licensed Executive Assistant for The Alter Home Team. I bring years of property management and customer service skills to the team. I assist the team, as well as buyers and sellers, through the home buying and selling process. I love working with people and helping them understand the process of home buying and selling.